Assamo made an excursion to Eritrea on 2 May 2013. 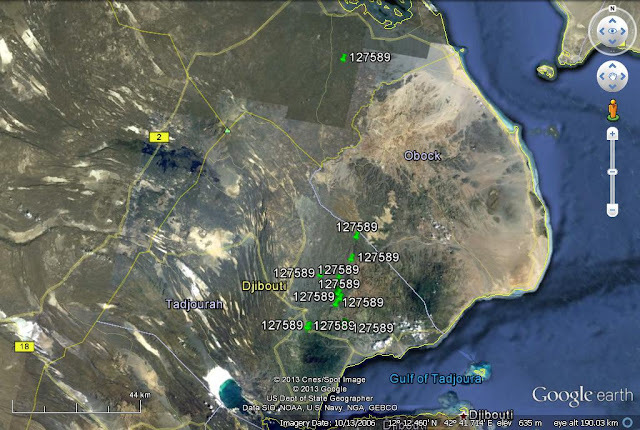 During the period shown on the map (28 April - 2 May) Assamo behaved much like he has in the past, mostly moving between settlements to the north of Tadjoura town in northern Djibouti. However, on 2 May Assamo was located briefly in Eritrea in the Danakil province in the south. This movement seems very much like a short excursion because 3 hours before and 3 hours after being located in Eritrea, Assamo was moving around north of Tadjoura, 75 -90 km to the southwest. So, since trapping, Assamo has spent most of his time in Djibouti, but has ranged widely within that country. He has also made excursions to Ethiopia and now Eritrea, albeit short excursions in both instances.